Visit the XLS Medical website for support and advice on how to reach your weight loss goals. 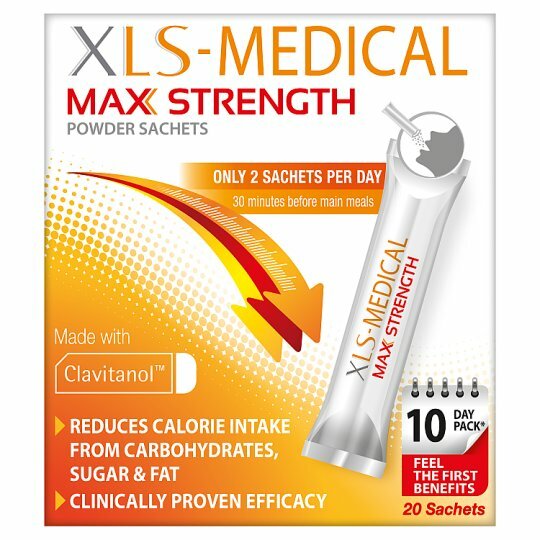 XLS-Medical Max Strength Sachets reduce calorie intake from main nutrients: Carbohydrates, sugar and fat. It contains Clavitanol™, a patented natural complex which reduces the break down and absorption of these nutrients into calories. This results in reduced calorie intake which helps you to lose more weight than dieting and exercise alone. It's clinically proven. XLS-Medical Max Strength Sachets, in single dose, makes weight management easier than ever before. The convenient and discrete sachet format is easy to take anywhere, just pop it directly into the mouth - no need for water and the ready-to-take powder has a delicious fruity flavour. This is 10 day trial pack. After 10 days you may experience initial weight loss progress and feel the first benefits: reduced food cravings particularly of sugary food, lower calorie intake and gentleness on your system. To achieve desired weight loss boost we recommend to take XLS-Medical Max Strength for at least 1 month or more. XLS-Medical Max Strength is a certified Medical Device with safety and efficacy assessed under European Medical Device legislation. Take one (1) sachet 30 minutes before two (2) main meals of the day. Do not exceed two (2) sachets daily. The sachets are ready- to use; pour the contents directly into the mouth. Do not pour the sachet content into a drink before consuming. If preferred, consumption of the sachet can be immediately followed by drinking some liquid. XLS Medical Max Strength Sachets are an excellent tool to prevent weight gain, for example when eating a calorie-rich meal. Please read the product insert carefully.